In my previous post about RoadArt, I talked about the art pieces I encountered traveling east from Mullingar. This time, I will concentrate on the art sculptures around Dublin and its surroundings. Eccentric Orbit byRemco de Fouw and Rachel Joynt (2002) is located on the North strand in Portmarnock, Co. Dublin. This large limestone sphere was commissioned by the Southern Cross Trust to commemorate early 20th century aviation. Noted aviator Captain Charles Kingsford Smith, departed from the Velvet Strand in June 1930 in his Fokker aircraft The Southern Cross, to reach Harbour Grace in Newfoundland, Canada 31 and a half hours later. Smith gained world renown when he made the first trans-Pacific flight from the United States to Australia. 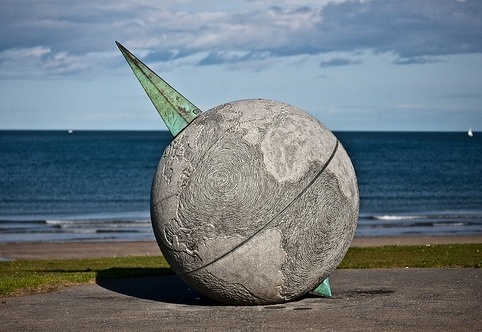 The surface of the sphere in Portmarnock is carved to detail the ocean currents and the countries’ topographies while a bronze compass needle at the top of the sphere points directly at the North Star. The sphere is pinned with bronze studs to show the stopping points on the journey to Australia. This impressive globe is a homage to pioneering navigators like Smith and Irishman J. P. “Paddy” Saul who was Smith’s navigator on his round the-world trip. It pays tribute to the men and women who travelled around the world in harsh conditions and without the technologies of modern aviation. Beehive Huts by Irene Beurer and Robert Mc Colgar (2001) can be seen at the Balbriggan by-pass on the M1. The artists were inspired by local Medieval history. Beehive huts or clocháns were one of the oldest stone structures in Ireland. The three corbelled beehive huts are grouped together and are in between one to two metres in height, each one bearing one or more air-vents. I find it fascinating when I drive along this road I always get the feeling that these cut-stone huts have just been dug from the ancient past, they seem so intrinsic to the Irish landscape. Amnesty International commissioned The Universal Links on Human Rights in 1995 to represent the jails around the world holding prisoners of conscience. This memorial sculpture by Tony O’Malley is located in Dublin city centre close to Amiens Street, at the back of Customs House and across from Busáras. 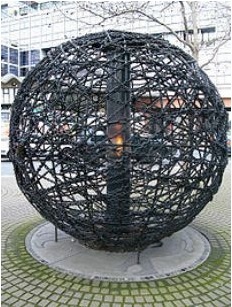 This simple art structure of welded interlinked chains and bars measures 2.60m in diameter and houses an eternal flame powered by natural gas. This commemorative art piece is always strikingly relevant as it reminds us on a daily basis that freedom of speech and democratic views are not a reality in many societies throughout the world. Famine is a poignant artwork designed and crafted by sculptor Rowan Gillespie. It was commissioned in 1997 by Norma Smurfit to commemorate the anniversary of the Irish Famine (1845-1849). The sculpture, located on Custom House Quay in Dublin city centre, was subsequently donated to the Irish people. It represents a group of seven life-size emaciated figures in rags heading to the nearby harbour, alongside them and threatening is a growling dog. One of the men carries a tired or sick child across his shoulders while the other men and women hold their meagre belongings in their arms as they wait to embark on board a ship that will take them to a new life in a new land. I find this bronze sculpture extremely moving as the artist has managed through his work to represent the emotion of fear felt by these bedraggled distressed people. Standing beside these ghost-like figures is a pretty eerie and disturbing experience. You can almost feel the suffering and the hardship thousands of Irish people went through during the Great Famine and appreciate a little the impact it had on Ireland for generation after them. The location of the art piece is particularly appropriate and historic as one of the first voyages of that horrific period was on the Perserverance, which sailed from Custom House Quay on St. Patrick’s Day in 1846. 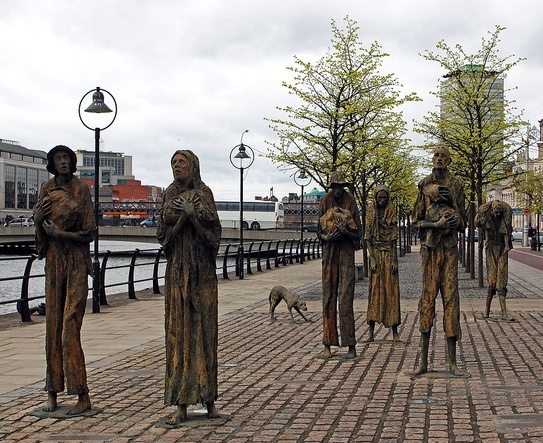 In June 2007, a second series of famine sculptures by Gillespie entitled Arrival, was unveiled by President Mary McAleese on the quayside in Toronto’s Ireland Park to mark the arrival of thousands of Irish emigrants to Canada. Blackrock Dolmen is an earlier art piece by Rowan Gillespie (1987) and is located on the N11 at the Blackrock bypass. This bronze and fibreglass sculpture is graceful in its shape and acts as a praise to the Irish cultural heritage. The Blackrock dolmen is unusual as three slender women replace the traditional upright stone slabs of a dolmen and hold the large flat stone or capstone above their heads and face outwards. Their body movement seems to almost suggest a light dance as they twirl around on their tiptoes. This artwork makes me think of the 2nd century Roman marble statue, The Three Graces, which is part of the ancient Greek and Roman collection in the Louvre museum in Paris. 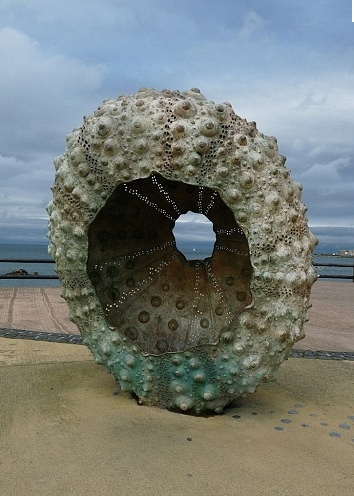 Mothership, a giant cast iron and stainless steel sea urchin by Rachel Joynt (1999) is quite an iconic artwork located on the Sandycove Seafront. It is as if the rough sea threw up the shell onto the shore one stormy day. Once on the shore, the sea urchin came to a halt and has remained suspended in motion, leaving a trail of silvery seawater droplets in its track. It is possible to climb into the body of the shell and by doing so, you enter a different dimension, feeling cocooned and therefore protected from the outside world. When inside, you are able to look through it and out onto the sea as if you were looking through a porthole of a ship. 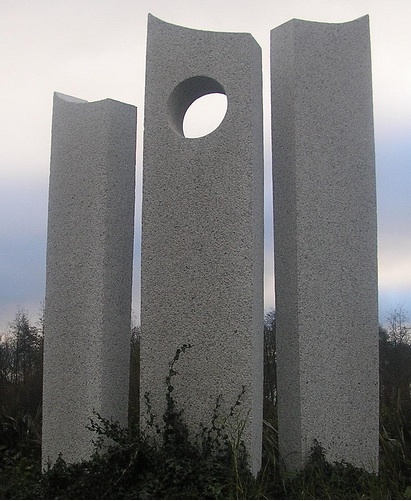 The minimalist granite sculpture, Dunrath Group, (1995) located in Loughlinstown, South County Dublin is by the artist Thomas Glendon. It depicts a family group in a pastoral setting and is reminiscent of Constantin Brancusi’s style in its modern simplicity. The granite used to carve this three-piece sculpture was sourced from a quarry in the Dublin mountains and was chosen for the uniqueness in its mica composition.